My girl, like a lot of kids, loves to color. I like to keep some crayons and paper in my purse for restaurants and other situations where waiting might be involved. But I wanted something a little nicer than a zip bag full of crayons. Thanks to Pinterest (of course!) 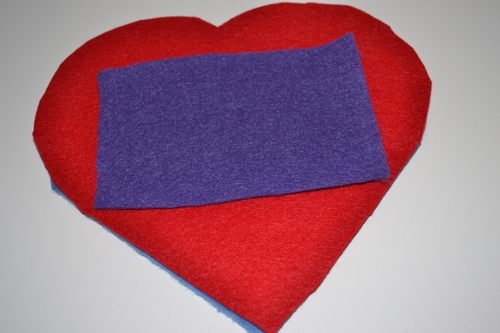 I came across this felt egg-shaped crayon holder from Skip to My Lou and decided instead of an Easter theme I wanted to make a heart. And instead of making it just to hold crayons, I would make it big enough to hold one of the upcycled box notebooks I shared with you earlier. What I came up with might be a little big for most people’s purses (it’s 6.5 inches wide at the widest point, and 6.5 inches tall, how about that?) but I have a gigantic mom bag so I think I’ll be fine. But it would also be fun just to use at home. 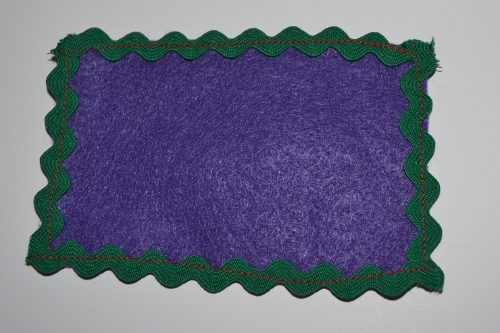 If you have a felt stash, you probably have everything you need for this project. 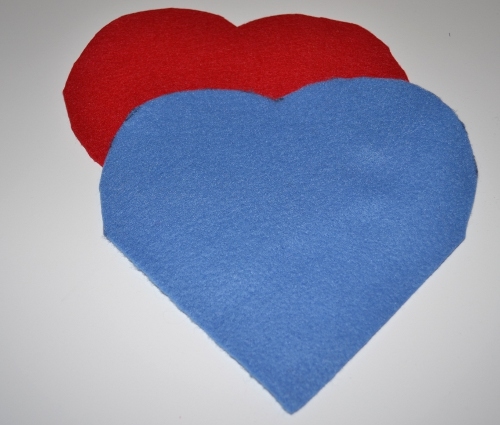 Use the heart template to cut out a heart shape in your two main colors. I cut one heart from the template and the other from the heart, so they would match better. Cut out a piece of your third color to make your crayon pocket. Mine is pretty much exactly the size of a piece of scrap I had, which is roughly 4.5 by 3.25 inches, but you can make yours whatever size will fit on your heart. Cut rick rack to sew around edges. Sew around edges. You could probably do this at the same time you attach it to the heart, but I did it separately. Remember if you do it at the same time that the top needs to be open for the crayons to go in! I happened to have green rick rack, but use rick rack, ribbon, or anything else. Sew the pocket onto the heart, then sew channels for the crayons. I made six, but the first one is pretty tight. It will depend on how big you make your pocket how many crayons can fit. 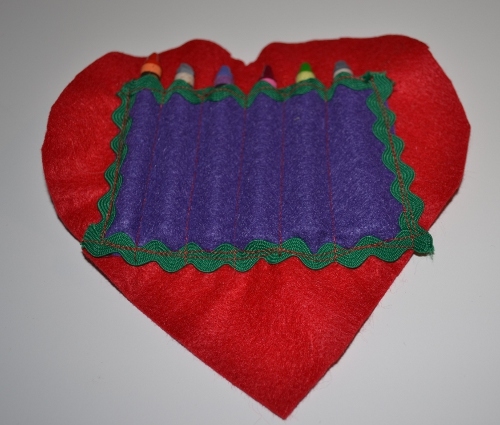 My crayon pouch sewn onto one heart. Repeat steps 2-4 for the pocket for the notebook. Mine is again from a scrap and is about 4.5 by 4 inches. 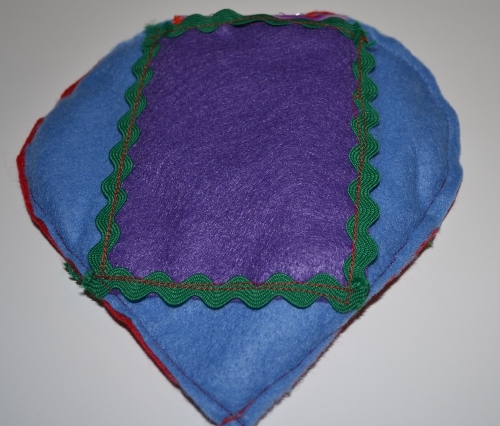 The book pouch sewn on the other heart. 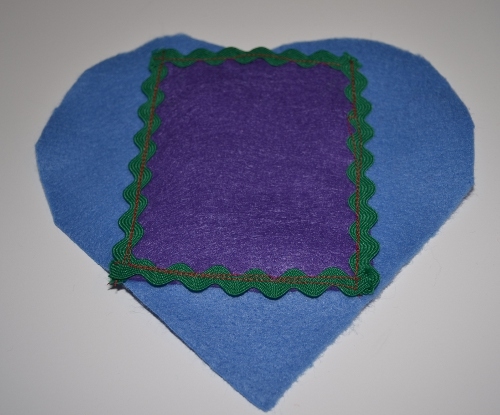 Place the hearts together, pocket sides out, and sew together. The crayon side of the finished heart coloring caddy. 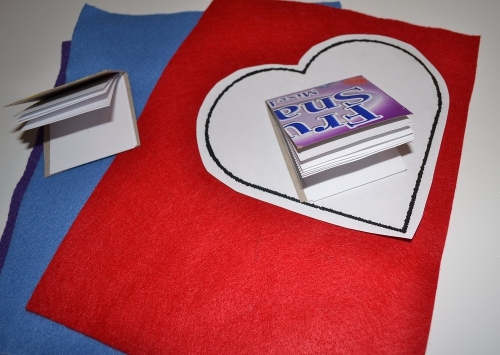 This project was pretty easy and quick just the way it’s written, but if you lack sewing skills you could do most of it with our old friend fabric glue. I think you’d still need to sew the channels for the crayons, though. And of course you could make the base just about any shape you want, for any holiday or no holiday at all. 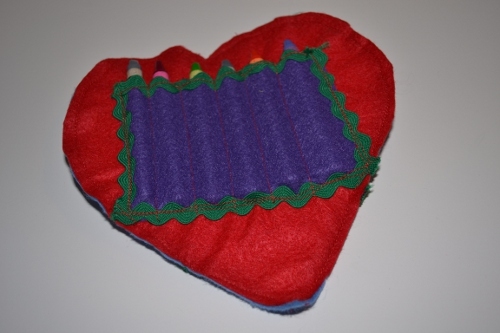 The back side of the heart crayon caddy, with notebook inside.